Tourists can be incredibly stupid. Travelers can be outrageously dumb. Do the locals know their own country, or can they be stupid? Often in our misguided understanding of the world we think the locals understand their country; this is an example of this misguided belief. There are two more examples at bottom of this Journal Post explaining some misguided reasoning. Ask advice from people who use a bus, do not ask not from people who do not use the bus. 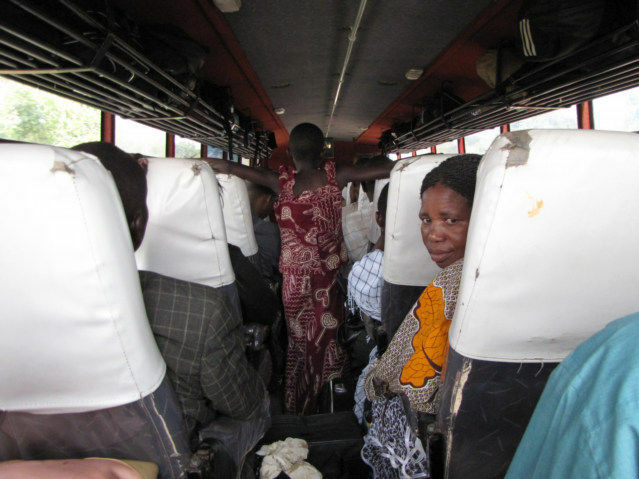 This a full size normal bus, I rode on this bus from Mubende to Fort Portal, Uganda, it was torture, I had to sit in the back seat and had motion sick the whole way, almost lost the Chapatti I ate before boarding the bus I never thought of Chapatti as being greasy until I came to Africa. I was in Mubende, Uganda waiting for what Ugandans call a Taxi, what Kenyan calls a Matatu and what I call a van to come and take me to Fort Portal, Uganda when I met a nice woman by the name of Jessica. The trip is about 75 miles, this distance can take anywhere from 1.5 hours to 5 hours depending on the level of chaos both are short trips for a traveler. 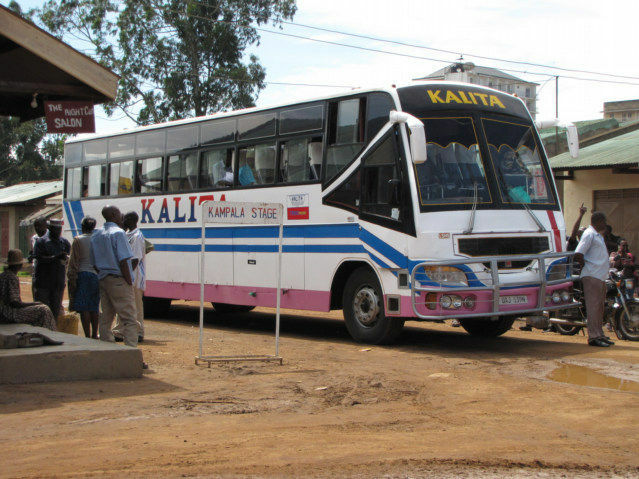 If I were lucky, I would get on this large bus, and then possibly travel directly from Mubende to Fort Portal in about one and a quarter hour. I am sitting in the back seat of the bus, taking a Photo of my new friend Jessica that may need to stand for 2-4 hours. Well, I was thinking to myself, this women is nuts, this is Africa, however 75 miles is a short distance, I will follow along and see if she is correct, maybe I can learn a trick or two about Uganda. Ok, the big bus cost 10,000 Uganda Shillings, and I believe the small van cost 8,000 Shillings. The bus arrived, they make us pay before we could board the bus, when I get on and discover there is one seat in the absolute rear of the bus and not enough for all the passengers, Jessica is left standing. The back seat of a bus bounces up and down; this is the best seat on the bus to get motion sickness, and I become motion sick easily. Well, the only way to know if a new friend makes bad decisions is allow them to lead the way. Generally, Jessica was great person, a happy, generous and helpful person. I enjoyed the conversation, I enjoyed spending 5 hours with Jessica to travel 75 miles. 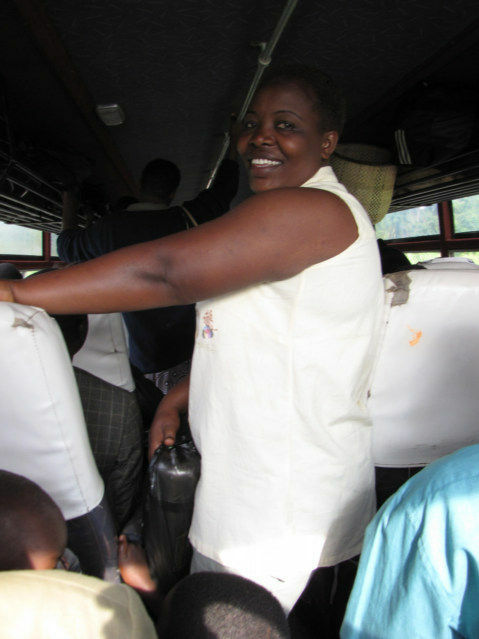 I am a traveler, Jessica is a person who lives in Mubende, I probably have taken more buses in Uganda in one week then she took in one year. I made a new friend, and elongated my trip by 2-3 hours. Tourist will ask locals what the money exchange rate is, why would a local need to know, they do not need to change money. Yes, in some countries, they all seem to be preoccupied with this; however, in a normal stable country, they are not concerned or aware. Tourist and Travelers will ask people to look at a map and explain where to go, generally the average person on a the planet has never went more than 20-30 miles from their home, has no need for a map, and has never used one. Note, if you want to give a nice gift to a friend, give them a map of their country.